When a CTD just doesn’t start pumping. 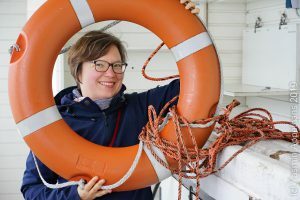 In this post, I talked about how student cruises always happen to be on the perfect days, and then in this post I talked about how to read CTD profiles. So now knowing all of this, here is a confession: I have never seen so much weird stuff happen to the CTD as on student cruises! Last year, I took my students of the GEOF130 course out. 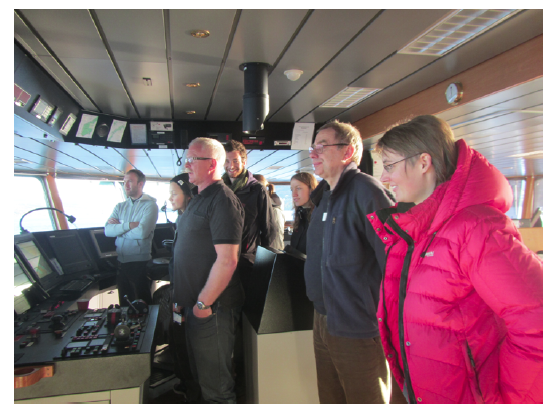 We had two groups on a one-day cruise each, on FS G. O. Sars, the new-ish and fancy Bergen-based research ship. Of course, as any real cruise, we started with a safety briefing with the officers. 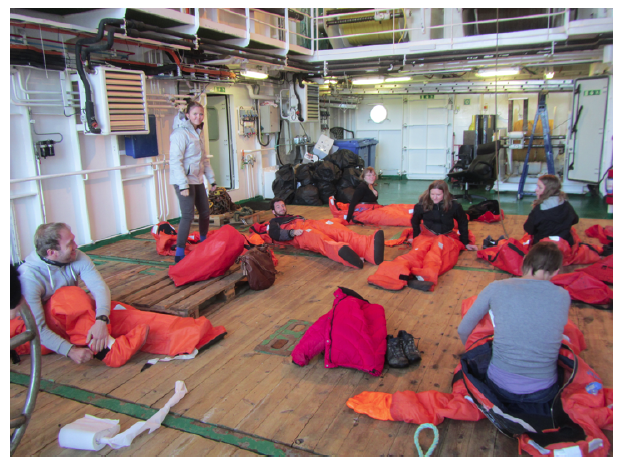 But listening to the rules wasn’t enough, students had to also try on the survival suits. But then at some point, we started doing science. Since I already talked about what the CTD operator typically sees on the screen, I’m only showing you the ones you haven’t seen yet. Did I mention that the G.O. Sars is a pretty fancy ship? 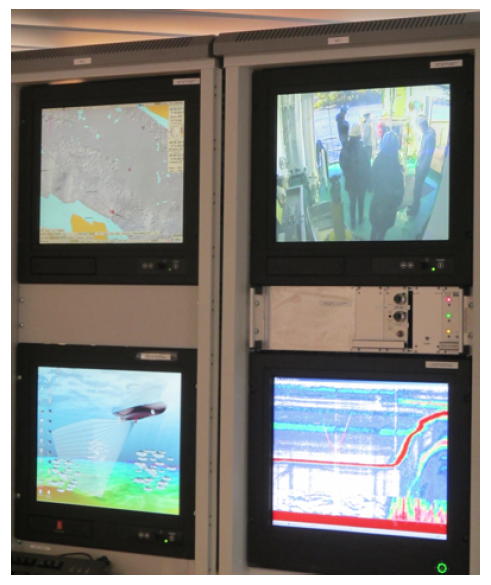 And this doesn’t even show the met data or fish finder, which were on yet another cluster of screens. Finally, we were on station and ready to deploy the CTD. 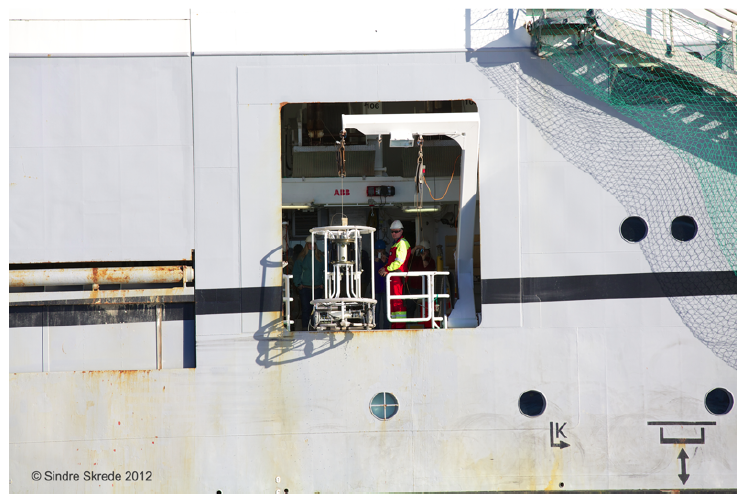 But then, when the CTD was finally in the water, we waited. And waited. And waited. And nothing happened! We waited some more, but the pump on the CTD just didn’t switch on. 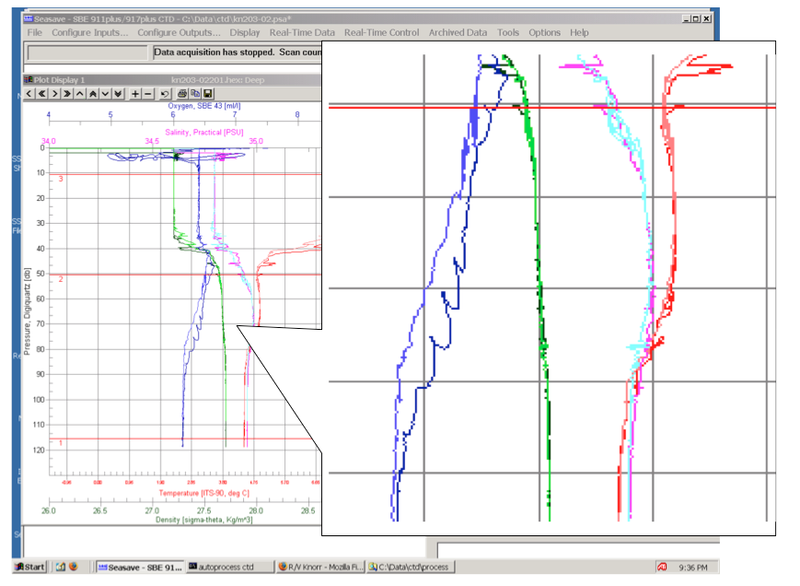 We lowered the CTD. And lowered it some more. And waited. And then, when we were almost ready to bring it back up on deck, we brought it even deeper and it started up! When we got the first readings, we realized what had been the problem. 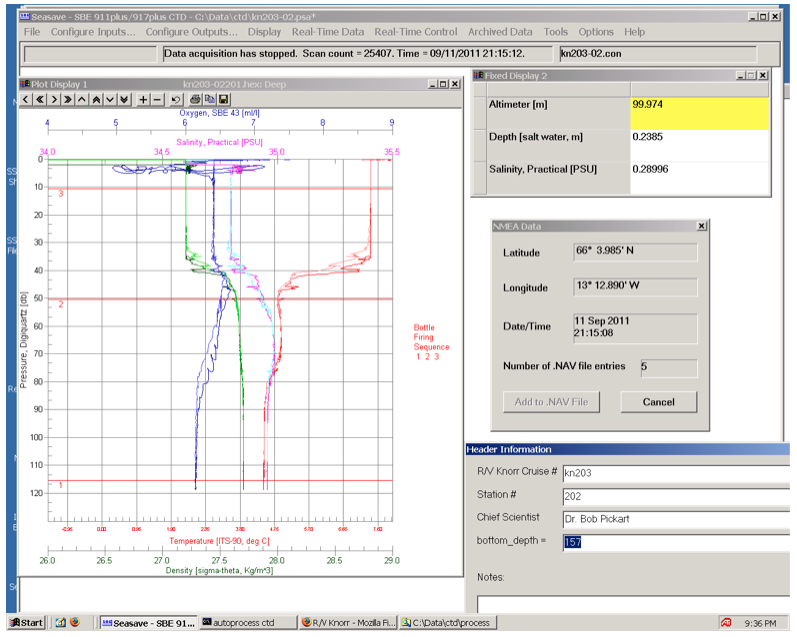 The CTD pumps are set to switch off when salinities fall below a certain value. This is done to make sure the pump switches off when the CTD isn’t in the water any more to avoid having the pump run dry. 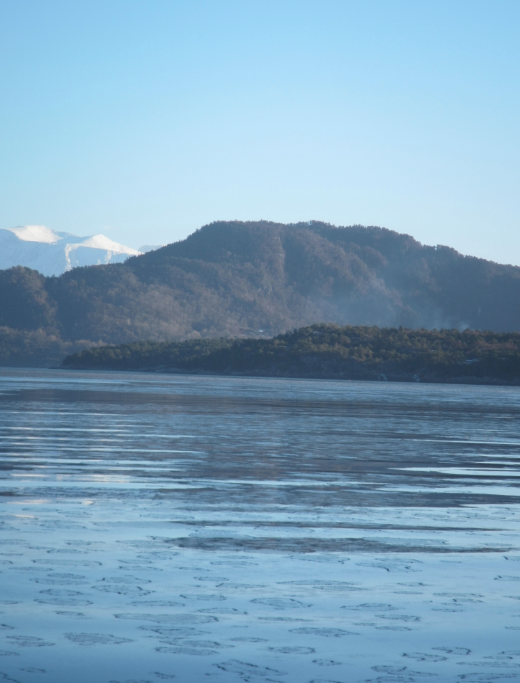 And since we were in a fjord (where we typically have a fresh layer on top, see this experiment) on a calm day after a very calm week, clearly, the salt stratification had become so strong that we couldn’t even measure the top layer because our CTD didn’t recognize it was in the sea! I’ve never seen this happen before. 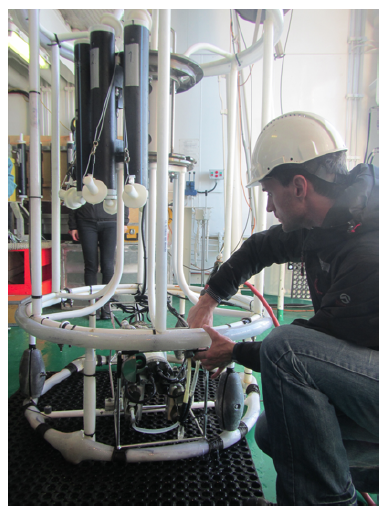 But then finally we brought the CTD back up on deck and students could start to practice sampling. We were incredibly lucky with the weather, and since we had Sindre Skrede visit us, we can even document it with beautiful pictures! This entry was posted in demonstration (difficult) and tagged CTD, GEOF130, student cruise on December 13, 2013 by mglessmer. Why student cruises always end up being on the most beautiful days of the year, or: why student cruises are an important part of the education. Remember the picture I showed in the last post, that was worthy of being on an Advent calendar or postcard? The one below? 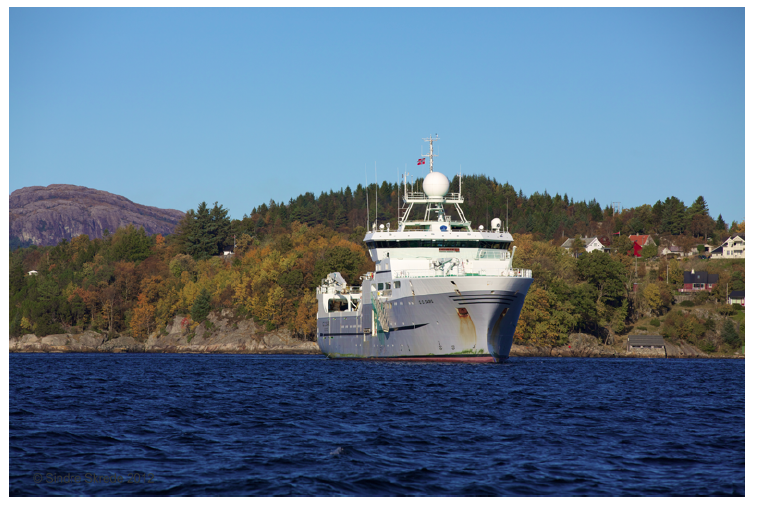 FS Håkon Mosby arriving back in Bergen in November 2013. That was taken on this year’s GEOF130 student cruise. 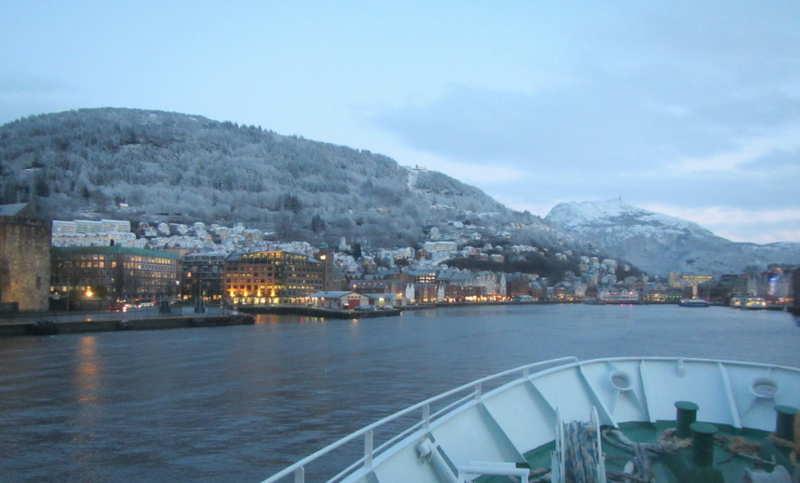 And remember the ice-on-Hardangerfjorden picture I shared a while back? This one? 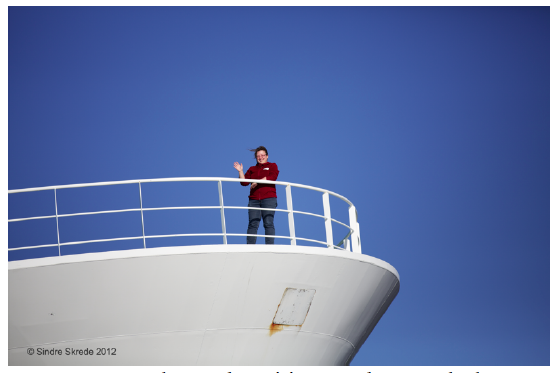 Oh, taken on this year’s GEOF332 student cruise. So how come we always end up being out on the perfect day? Well, firstly, clearly I am that good. Or that lucky. But then, the perfect day only becomes the perfect day when you give it the chance. What I mean is that on student cruises, it is easy for a day to become perfect. Because it is exciting to be on a research ship for the first time, to figure out how to measure oceanographic data, to develop a feeling for how much the ship is actually supposed to be rolling before you have any reason to become concerned, to see how your oceanography classes apply to the real world, to put on an orange one-fits-all survival suit, to gauge how you can influence the quality of the data by paying attention (or not), to get a break from your everyday life, to eat all the awesome food all the time, to visit the captain on the bridge, to see the familiar city from the water, to see a whole new world opening up to you, to experience what it could be like to be an oceanographer. 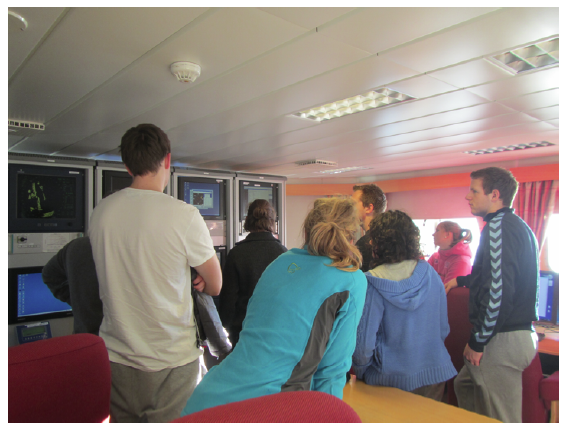 Especially in the “introduction to oceanography” lecture GEOF130, the student cruise is so much more than just knowledge transfer – it is an incredibly important part of building a professional identity that helps students to find motivation to sit through boring lectures and to fight through difficult exams because in the end they will then get to do this again: to go an another cruise and have more perfect days at sea. This entry was posted in demonstration (difficult) and tagged CTD, GEOF130, GEOF332, student cruise on December 9, 2013 by mglessmer.